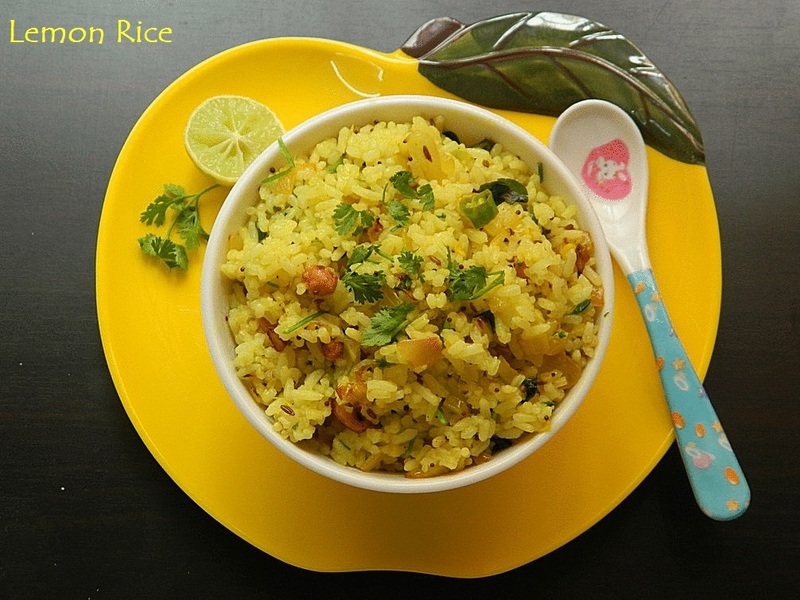 Lemon Rice is an easy bachelor recipe and such a simple one pot meal that it can be prepared by anyone :) We have already seen the recipe for Kanda Pohe. It is the same procedure, instead of soaked poha we need to add cooked rice, along with it we can also add nuts. This can also be prepared with the left over rice that you have in your kitchen. I usually prepare phodni bhaat with the left over rice using red chilli powder and tamrind paste instead of green chilli. But this one is very simple yet tasty. 1. Spread the cooked rice in a plate before using it so that it doesn't become sticky. 2. Heat oil in a vessel, when heated add mustard, cumin seeds, ground nut, curry leaves. When it splutters add chopped green chilli. 3. Add chopped onion, turmeric powder, and salt. Saute until onions become translucent. Now squeeze the lemon over the onions. 4. Add the rice,sugar and mix well. 5. Garnish this with coriander and serve hot with Onion Raitha. You can add the lemon juice after adding the rice. I added it early so that it gets mixed up well.